The folks who brought us a bourbon named for Thomas Jefferson also produce one honoring first and third President of Texas, Sam Houston. What are they getting at with this brand? Texans? Southern Union-sympathizers? Modern-day Know-Nothings? I can’t claim identification with any of these but I’m running out of new bourbons at Astor Wines (and it is such an odd yet stereotype-fitting name) so I picked up a bottle last week. Interestingly, this bottle of Sam Houston clocks in at a precise 85.6 proof, which got me thinking this is some veiled reference to they year 1856. After some quick searching though, this seems to have been a quiet period in President Houston’s life – though he did lose out heftily in the Know-Nothing party’s Presidential nominations to Millard Fillmore. Not quite juicy enough to be legit. Onward. 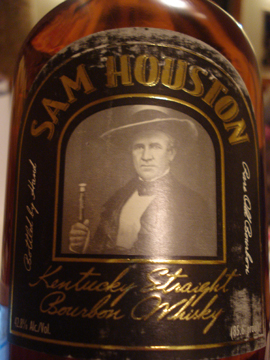 Though styled in a manner typical for bourbons (faux-aged, script, block letters, dark background) Sam Houston pulls it off comparatively well. At first I thought that the scuffing around the edges of the label was intentional, but after looking at a number of other pictures of the bottle, it seems to be unique to mine. If this is, in fact, real scuffing, I’d say it’s a happy accident that the Houston boys should emulate. If not, however, they’ve done a convincing job. The scent comes across as very hard and closed. There’s a dominant sense of hot asphalt just as rain is beginning to fall. Beyond that it’s just wood. That hardness translates into a smooth and rich opening on the tongue. This begins with a near-creamy sweetness that develops into a pleasant, mouth-filling rye and dry grass flavor. The finish is long, warm, and peppery. President Houston and I may not have much common ground personally, but this whisky (they don’t use the ‘e’) is fantastic. It’s dry, meaty yet well balanced, and has a good amount of depth to it. This is certainly one of the best bourbons I’ve had recently. Well done. “Old Crow Reserve” probably sounds a little ridiculous to those who have had some experience with the standard Old Crow. When I originally tasted that bourbon I was disappointed by its bland, unremarkable character, so it’s hard to imagine that whatever Beam has managed to “reserve” from their Old Crow line is going to be all that special. In fact, I’m curious about their motivation in releasing this label. Beam already has a full range of easy-to-find bourbons from Old Crow to Booker’s and everything in between, taking the Old Crow brand up a notch seems gratuitous. I don’t mean to knock bottom-shelf bourbons here. I’m a big believer that in the American whiskey world in particular price isn’t always a reliable indicator of quality. The modestly priced Old Fitzgerald 1849 remains one of my favorites, and I’m sure there are plenty of folks who love their Old Crow. Was there really someone thinking to himself “Gosh, if only this Old Crow were just a little bit better, but not as good as Jim Beam white label….”? At least the financial risk of finding out whether it’s worth it is low. I’m a sucker for black labels I think. The dark background makes all the other elements pop that much more. On top of that, the empty white of the regular Old Crow label just looks unfinished. On the Reserve here, we see a black and gold pinstripe pattern overlaid by the standard bourbon descriptors: “Kentucky straight,” “original,” “sour mash,” and the like. 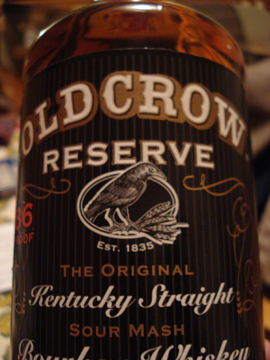 (It’s important to note here that Old Crow is named for the originator of the sour mash method.) I do appreciate the red-lettered “86 PROOF” on the left side and the way it contrasts with the rest of the presentation; on the other hand, I think they could do a lot more with their crow logo than they are now. Crows are such loaded signifiers: they’re harbingers of bad news, they gather in ‘murders’, they accompany witches and demons in pop culture. They should leverage this. There’s a lot more to the nose on this one that its unreserved sibling. Beyond the clear char, there’s an element that I find difficult to describe, but the closest I can get is the smell of a dry pine plank after you’ve sanded it down for a few minutes: strong wood, but not resinous and not exactly oak. So far so good. On the tongue, I get a strong sweetness up front with touches of orange and honey. This moves into a vanilla then quickly switches to charred oak and leaves a medium-dry and prominently woody finish. Buffalo Trace puts out some good whiskeys and what I’ve got here is where a lot of them begin: White Dog. “White dog” refers to the unaged distillate that eventually becomes bourbon. These unaged whiskeys are starting to pop up more and more in liquor stores (see: Death’s Door, Georgia Moon, etc), and they’re growing on me slowly. I’m not sure if I’d ever choose one over any full-blooded bourbon, but let’s see how Buffalo Trace’s offering measures up. Buffalo Trace White Dog comes in a short, simple bottle with a faintly mottled tan label. 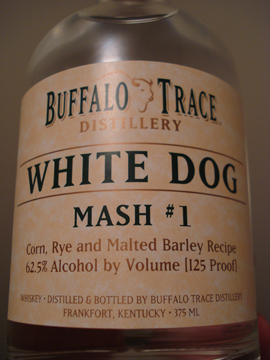 The front label shows the Buffalo Trace logo, the words “White Dog”, “Mash #1” and a listing of the grains and proof. The rear, however, gets into some nostalgic tale about the “brave pioneers” who traveled to Kentucky, distilling all the way. I guess when you’re selling white liquor it becomes more about the marketing than the complexity of the whiskey, but this story is pretty standard fare. Generally, though, I like the straight-forward design and it goes well with the simplicity of the product. The scent is surprisingly rich and smooth – it’s like rising bread dough, full and soft. This definitely is close to the grain. It’s also pretty big in flavor – the same rising sourdough flavor but a little sharper at first and settling down into something more yeasty. The finish is long (for something unaged) and yeasty as well. This is quite powerful at 125 proof and it’ll numb your mouth a bit if you don’t add some water, but try it both ways. I’m impressed. I can’t say I like it better than their main line bourbon, but this is far more flavorful than the other unaged whiskeys I’ve tasted lately. Strangely, this is something that could be a decent sipping drink if you’re in the mood for something different. 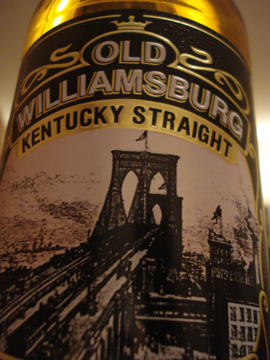 I’ve lived in Brooklyn for nearly four years now, but I’ve never had the occasion to try Old Williamsburg Kentucky Straight Bourbon. This isn’t much of a surprise since this 80 proof version doesn’t exactly rake in the good reviews. It is, however, quite cheap and that picture of the Brooklyn Bridge on the label ignites a little local pride (though I have to note that the Brooklyn Bridge does not actually connect to the neighborhood of Williamsburg at all). I can’t say that I’m expecting too much from this one, but it might have some potential to win in the quality-to-price ratio department given the small denominator in that equation. Let’s see. Old Williamsburg does not have a bad design. While the bourbon itself is a little on the sickly yellow side, that actually goes pretty well with the black and gold of the label. In the center is a print of the Brooklyn Bridge and surrounding it are some standard bourbon descriptors: Kentucky Straight Bourbon Whiskey. The only flourishes are some gold curls and a small crown atop it all. This front label, while hardly innovative, is certainly appealing. The rear label tells us that Old Williamsburg was the county seat for the city of Brooklyn in the late 19th century and requests that we make this our drink of choice. At the very end, in all caps, they’ve inscribed “THIS WHISKEY IS THIRTY-SIX MONTHS OLD.” I suppose that might fool some folks into thinking that it’s pretty old, but three years is considered to be on the young side in the world of bourbon. This smells a bit like car tires on a hot day and wet rope fibers. There’s some char and a decent amount of corn in there too. There’s not too much going on taste-wise however. There’s definitely some asphaltiness, a hint of wood toward the sides of the tongue, and corn, but for the most part it’s just heat and a clean but hot finish. Not unpleasant, though. Sadly, I’m impressed with the lackluster performance of Old Williamsburg – I wasn’t expecting even this. If I were throwing a party and needed something to mix with ginger ale, I might just use OW. This won’t hit the spot if you sip it on its own, but it won’t make a cheap cocktail into a terrible one. A month since my last post! Sorry about that. 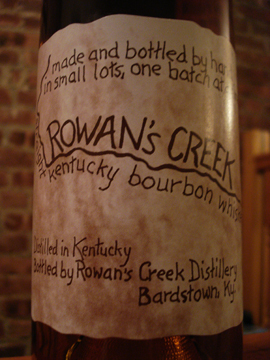 I’m back with one of those bourbons I’ve had my eye on for years but haven’t gotten around to trying: Rowan’s Creek. I have tried a few of the other offerings from Kentucky Bourbon Distillers out of Bardstown, though. Their line includes Johnny Drum, Willett’s, Noah’s Mill, and Kentucky Vintage among others – an impressive range for sure. Rowan’s Creek in particular has a solid reputation among the folks I’ve spoken to about it so this is one that should be interesting. Rowan’s Creek walks a fine line between appearing charmingly amateur and looking cynically so. The simplicity and written-out sentences on the front labels don’t come across like marketing-department copy, but the intentionally roughed edges and stained coloring just seem to be trying a little too hard. The rear label also goes off on one of those origin tales that bother me about a judge and his creek way back in the good ole days. That said, there is a theme of unabashed and unrefined pride in the product throughout the packaging, which for some reason comes across like they mean it. Otherwise, the bottle has a nice, more wine-like, shape and is topped off by a simple wax sealing. There’s a nice big nose on this one: I get sweet peaches, hot bricks, dried grass, and a touch of the alcohol coming through. On the tongue, that dried grass comes through but the sweetness doesn’t express itself until mid-way in the form of an almost-raspberry. The last half of it is strong on the oak end of the spectrum with spikes of dark chocolate in there. The finish is long, warm, and still oaky. What’s most impressive about Rowan’s Creek though is the mouth feel. This has a luxurious full texture to it almost to the point of feeling syrupy. Now that I’m a few sips into this one, I’m liking it more than when I wrote those words above. It is certainly developing over time in interesting ways. I like this quite a bit, but I think my expectations were a little high because it’s not quite what I’d hoped it would be. Oh well – I should enjoy it for what it is, a very good bourbon. I’m a loyal fan to the Old Forester Birthday Bourbon series – every year I look forward to its release and each year it is surprising and interesting in a different way. However, I’ve somehow never managed to try their main release. Old Forester claims to be America’s first bottled bourbon, and if I remember my Cowdery correctly, this is a result of George Brown desiring to guarantee the quality of the ‘medicinal’ bourbon he sold. By bottling only the spirit from barrels that met his standards, his customers/patients could be assured that they were getting the good stuff by making sure to purchase his personally signed bottles. At first glance the recently redesigned bottle in front of me makes some allusions to this history, hopefully it will measure up to its Birthday brethren. The Old Forester bottle has a simple, round, and reasonably tall base and a slightly bulbed neck leading to a small mouth. The front label is dominated by a red and cream diamond in the center with the brand name and the proclamation of being America’s first bottled bourbon. Behind this in pale gold script are some hyperbolic lines about the bourbon. In most cases this is nothing special, but on Old Forester it recalls the original use of bottles to convey the legitimacy of the product it contains. Just as George Brown presumably inscribed his bottles with descriptions of its quality – so too today. Over all the bottle looks fresh and appealing. The nose on Old Forester is strong but smooth. The dominant scent is of sweet orange – almost like orange soda. Behind that is some combination of oatmeal, oak, and maybe cinnamon. That sweetness is not nearly as strong upon tasting. There is a spark of it at he very beginning, but it quickly flips to a dry grain and oak profile that disappears quickly leaving a light, oaky (with a touch of that spice) finish. This certainly does not live up to the Birthday Bourbon releases, but that would really have been too much to expect for something at this price. I do wish that the flavor profile would have matched the far more appealing nose, though. I think this is not quite the type of bourbon I’d regularly sip on its own, but I wouldn’t hesitate to use it in my Old Fashioneds and Manhattans. Four Roses Small Batch was one of the earliest bourbons I tasted for American Hooch and now I’ve come back to try their entry-level offering here in the US, the so-called ‘Yellow’. The Four Roses series is often described as a less aggressive, rounder bourbon in contrast to the the many big, oaky, charred offerings on the shelf. The Small Batch definitely lived up to that, here’s hoping that the lower-priced Yellow doesn’t mean significantly reduced quality. 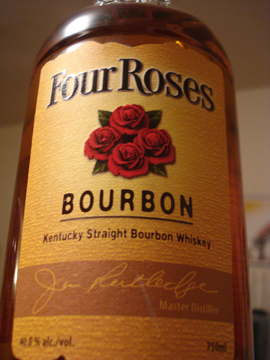 The Four Roses Yellow packaging, like that of the Small Batch, has a bit of a feminine streak to it. This is likely a conscious choice to match the cognitive associations with roses, but it’s done in a very understated way: a story about a “Southern belle” on the rear label, the round edges of the bottle and labels, and – of course – the flowers. They have done a good job of not over-doing it here. There are very few unnecessary flourishes in the script and the decoration consists of simply text and the four-rose logo. This is a good thing. The nose is disappointingly shallow. It’s got Band-Aid and some honey-lemon in there and some sharp alcohol, but that’s about it. Not displeasing, but just not much. On the palate, Yellow is definitely smooth. It’s also pretty fruit-driven with melon, lemon, and only the slightest bit of heat. The finish is almost non-existent making this seem like I’m drinking a very subdued cocktail instead of a straight bourbon. There’s nothing fantastic about this bourbon, but nothing really wrong with it. It is pleasant and has a refreshing quality that you don’t see in most bourbons – so it’s got that going for it. For $20 though? Not too bad, especially if you’re new to bourbons.